A large — and growing — number of companies use arbitration clauses in their overlong, legalese-stuffed customer agreements to prevent customers from bringing lawsuits and joining together in class actions, but can that arbitration agreement be used to avoid legal liability for possible violations of federal civil rights law? According to one federal judge, yes. What Selden’s complaint didn’t address at the time was Airbnb’s terms of service, which include an arbitration clause and a ban on customers bring class actions against the company (even through arbitration). And so, in response to Selden’s lawsuit, Airbnb asked the court to compel arbitration, meaning Selden’s dispute could not be heard in the public forum of a courtroom, but in private arbitration. Additionally, anyone with a similar dispute would have to enter into arbitration on their own, rather than merely joining on to Selden’s class action. Selden and his attorneys fired back [PDF], arguing that Selden had not actually agreed to the arbitration clause because Airbnb failed to give adequate notice of these terms. When Selden signed up for Airbnb on his iPhone, he did not even have to check a box to say that he’d read the site’s user agreement. 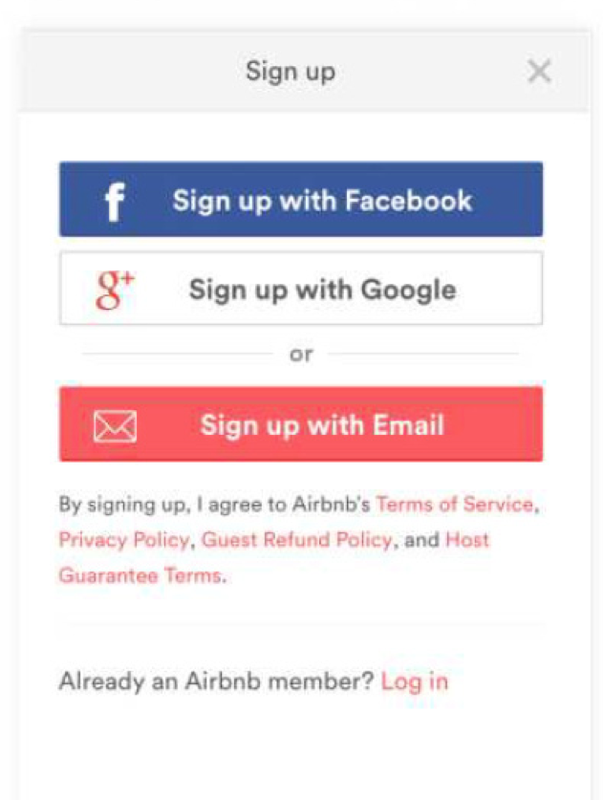 Instead, as you can see on the left, the Airbnb terms are passively agreed to by simply “signing up” for the site. It’s an argument that some courts have agreed with. Recently, a federal judge in New York denied Uber’s attempt to compel arbitration because its terms of service were similarly positioned on the company’s mobile app. Additionally, argued Selden, the arbitration agreement should only apply to those issues that are within the scope of the Airbnb contract. The alleged civil rights violations fall outside of that agreement, he contends. This morning, D.C. District Court Judge Christopher Cooper sided with Airbnb, issuing an order [PDF] to compel arbitration. The judge concluded that Airbnb’s link to its terms of service, and its explanation that “by signing up” you agree to those terms, was sufficiently conspicuous to pass legal muster. Additionally, because terms of service and user agreements are so commonplace in the current era, the judge said that almost all consumers are already aware that they must be agreeing to some sort of conditions when they sign up for an online service. “[I]gnorance of the precise terms does not mean that consumers are unaware they are entering contracts by signing up for internet-based services,” explains Cooper. Other courts have given a broad interpretation to similar language, says Cooper, and so he must follow their lead. With that, the judge stayed Selden’s federal suit and compelled the dispute into private arbitration. UPDATE: In an emailed statement to Consumerist, Selden’s attorneys say their client will be appealing today’s ruling to the D.C. Circuit Court of Appeals. “Airbnb continues to request that their customers who still experience Airbnb’s ongoing pattern of discrimination, be placed into arbitration,” reads the statement. “By placing Mr. Selden’s claims into arbitration, a consumer’s constitutional rights to a jury trial and access to the courts of law continues to be whittled down gradually but surely.